The anodized surface makes it the real aluminum aloy pipe. The durable to wear is 3 times than the regular chrome plating. Erosion resistant, weatherproof and good insulation. Light and ready to use without plating. 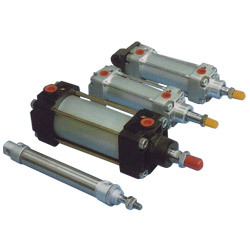 And are ideal for pairing with pneumatic cylinders, lightweight thin cylinders. The hard chromium piston rods produced by our company come with more than JIS S45C material but also in SCM440, SUS 304, SUS316, SUS 431, SUS 410, SUJ-2, where the rods first undergo precision milling and processing, and are then put through hard surface chromium treatment, allowing a surface precision level of f8, and a surface hardness reaching HV 850 minimum and up, which not only help to improve wear resistance but also help to exten the life cycle of the rods, thus helping the customer save cost. 1. Aluminum alloy pneumatic cylinder tube: 2. Material: JIS A6063TD-T5. 3. Internal roughness: RZ3.2S Max. 4. Tolerance: H9. 5. Anodic oxide film: 30µ±5µ. 6. Hard chromium piston rod: 7. External diameter accuracy: f8. 8. Surface roughness: Ra 0.2µm-0.4µm. 9. Hard chrome thickness: 20Micron±10%. 10. Surface hardness: HV 850 (minimum) up. 11. Material: JIS S45C, SAE1045, DIN CK45, SCM440.